Greening your corner of the world by appreciating local abundance, aligning your wants/needs/haves, and being a sustainable leader at work, in the community, and at home. Yes, it seems too early to start cleaning when there is a new coating (or more) of fresh snow…AND if you start now with one small project a week you will be ready to sit outside with a Mai Tai on the first nice day of Spring/Summer! First, I must acknowledge Amy Jane Stewart and her company Organica Jane for teaching me about the dangers of toxic cleaners. Go to her site http://www.organicajane.com for details. She leads a “Home Green Home” workshop in the Rochester area every now and then and is a wonderful massage therapist and kind soul! Using non-toxic cleaners is good for everybody everywhere! No worries about having to stay out of a freshly cleaned area for the smell. Using natural cleaners means children, pets, and you will not be inhaling fumes or touching toxic surfaces. No worries about using cleaning products near your food prep or food storage areas. Of course, no worries about what you are putting down the drain into our rivers and lakes. All good! 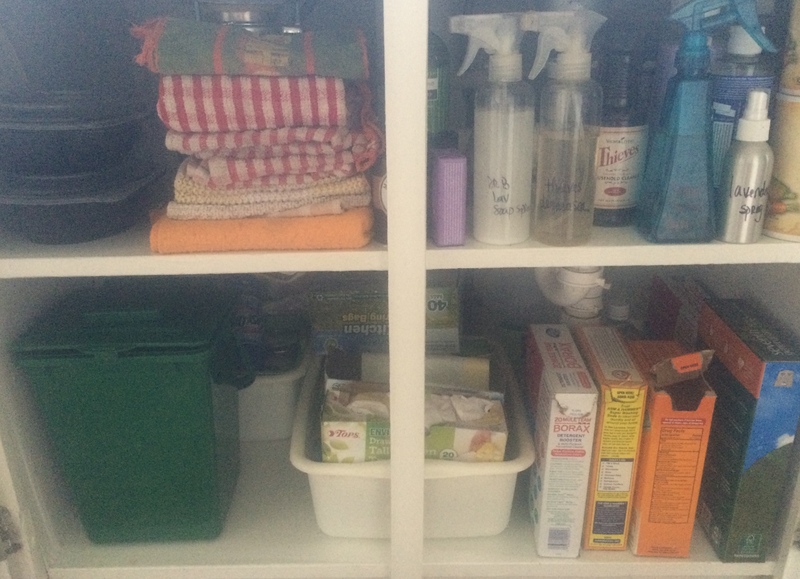 My suggestion is to use up what you have and slowly switch over to fewer, greener products…there will no longer be need for overly specialized “uni-tasker” products – you know – ONLY for the tub, or ONLY for the kitchen sink, or ONLY for the windows in the room where Mom stays – haha. If you really look around the next time you are in the cleaning aisle, you’ll see the hundreds of single purpose toxic cleaners designed to take money out of your pocket. Baking soda (in the big box to save $), white vinegar, salt, Dr. Bronner’s liquid soap (or bar), Borax, Arm&Hammer Washing Powder, salt, essential oils (I like lemon, rosemary, peppermint and lavender for cleaning), distilled water for room sprays (tap water is ok for cleaners in my opinion), empty spray bottles (metal is best), rags (buy them or cut up old t-shirts – I have stopped using paper towels) cellulose/made from plants sponges, aluminum foil and steel wool. All of the above are at Wegman’s yay! Yes the rags have to be washed but it feels good to know I am not creating more trash or using trees to wash my house. I use the rags once then wash ’em – especially my dish towels – kitchen is the number one area for germs according to the NSF (National Sanitation Foundation), an OSHA accredited public health and safety org. Will it really clean? Will it really take care of the germs? Yes. The natural properties of these products can do that – especially baking soda. There will most like be a transition in getting used to what you think “smells clean”…if you grew up thinking a bleach smell or a “pine-sol” smell meant clean, then it will take a few weeks to enjoy a new smell of lavender, mint or lemon – yay! Or maybe NO smell will come to mean CLEAN for you. I do most of my cleaning with the miracle called Baking Soda. AKA Sodium Bicarbonate, it has a mild alkaline pH causing dirt and grease to dissolve easily in water and for effective removal of grease or waxy films. Sprinkle on a damp sponge and baking soda is replacement for “comet” as a mild abrasive. Salt or Borax also works as an abrasive and if I need a soap, I add a little Dr. Bronner’s. RECIPES/INSTRUCTIONS – HAVE FUN! CLEAN GREEN! Sink/Tub/Toilet – Sprinkle baking soda and scrub with rag/sponge. Add soap or thieves. Rinse! Frig/Stovetop – Spray with thieves spray. OR use a damp sponge with a little baking soda. Oven – Guess what? Make a baking soda/vinegar paste, spread in cold oven, let sit and wipe. You may need some elbow grease and may need to use a ball of tin foil or a steel wool scrubby if there is a big mess. Drain – Cup of baking soda (surprise) down the drain, follow with a cup of vinegar and watch it fizz :), let sit, follow with boiling water, plunge if needed. Fruit/Veggie Rinse – Soap spray: a squirt of peppermint Dr. B soap (there are other scents) in the sprayer then fill w distilled water. Bette Vangen on I HAVE MISSED YOU!